Spanish and Finnish police, with the help of European law agencies, have arrested 25 members of a suspected prostitution ring preying on young Nigerian women. "The victims, mainly vulnerable young Nigerian women, were recruited in Nigeria and trafficked to Spain via Italy," Europe's Hague-based policing agency said. "Once in Spain they were forced into prostitution, mostly in the cities of Benidorm and Malaga, but also Madrid, Barcelona, Soria and Gandia (Valencia)," Europol said in a statement. Spanish police arrested the gang members in several Spanish cities, but its leader was taken into custody in Helsinki, where she was arrested by the police, thanks to effective international cooperation. The probe was started when authorities were alerted that two Nigerian women who were seeking asylum could be victims of human trafficking, Europol said. "Investigations revealed the existence of an organised crime group operating in Spain that had a big infrastructure in Nigeria, as well as links in Niger, Libya and Italy." The women were smuggled to Spain where they were told to seek international protection and asylum "so that they could work for the criminal organisation without problems in the event of being identified by the police," Europol said. The group provided the victims with fraudulent documents to request asylum, it added. in coordination with the Finnish law enforcement authorities, and supported by Europol and Eurojust, have dismantled an organised criminal group involved in trafficking women for sexual exploitation. The victims, mainly vulnerable young Nigerian women, were recruited in Nigeria and trafficked to Spain via Italy. Once in Spain, they were forced into prostitution, mostly in the cities of Benidorm and Málaga, but also in Madrid, Barcelona, Soria and Gandía (Valencia). Twenty-four members of the criminal group have been arrested in different Spanish cities by the Spanish National Police. The ring leader was found living in Helsinki (Finland), were she was arrested by the Helsinki Police, thanks to effective international cooperation. 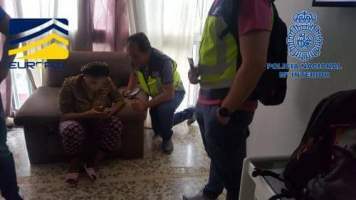 In total, four house searches were carried out in various cities in Spain, and one in Helsinki, resulting in the seizure of important documentation, IT equipment and numerous smartphones. The investigation began when the Asylum and Refugee Office of Madrid launched an alert that two young Nigerian women could be victims of human trafficking and sexual exploitation. Investigations revealed the existence of an organised crime group operating in Spain that had a big infrastructure in Nigeria, as well as links in Niger, Libya and Italy. This allowed the network to control the whole trafficking process, from recruiting the victims in Nigeria, to smuggling them via Niger and Libya to Italy, and from Italy to Spain, where they were forced into prostitution. The victims were instructed to request international protection and asylum in Spain, so that they could work for the criminal organisation without problems in the event of being identified by the police. The group also provided the victims with fraudulent documents to request asylum. Europol supported the investigations by facilitating information exchange and providing analytical support. On the action day, two Europol analysts were deployed to Spain for on-the-spot support including real-time data exchange and cross-checks against Europol databases.